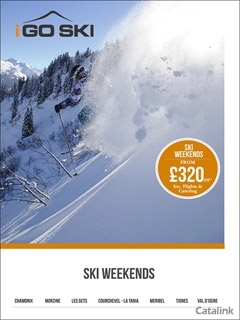 To order a printed copy of the iGOSKI - Ski Weekends brochure, simply click the Request button below. Igoski offers fast, flexible and efficient weekend and week long ski breaks, where skiers can dynamically package their own break by mixing and matching the various components of their holiday. Their brochure is packed full of exciting destinations, pictures, value prices and holiday information. They offer popular Sunday to Wednesday midweek breaks with 3.5 days skiing for under £320 (including flights and catering). Whilst our 3 or 4 days weekends start at £349 and our weekly packages start at an unbeatable £399. Using a host of value and luxury ski properties, igoski provides a personal and high quality service from the moment you make contact with their specialist sales staff in London. They have selected only the finest resorts in the French Alps to ensure that you get maximum enjoyment and snow sure slopes this winter! Igoski will allow you to tailor and book your package online, where you can select as many or as few components as you need: from accommodation–only to a full blown flights inclusive package with ski hire, lessons and liftpass! They hope that you enjoy their brochure which gives a broad overview of their resorts and accommodation with some guide prices. However for all the latest up to date information and 'live' prices please visit their website. By pressing the Request Printed Brochure button you give consent to iGOSKI - Ski Weekends (and their Data Processors for the specific purpose of delivering your literature) to send you their Brochure .